Although you can’t see or feel them, Dust Mites can adversely affect your health in numerous ways. 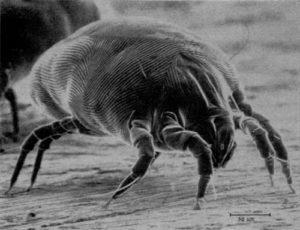 Dust mites are found in carpets, rugs, upholstery, mattresses and other soft furnishings. They can cause allergies, sneezing, itchiness, lung problems, runny noses and inflamed or infected eczema. We use the ChemDry Dust Mite treatment, which greatly reduces the problems they cause. ChemDry CleanDry has the equipment, technology and techniques to treat areas and soft furnishings infected with Dust Mites. Our expert cleaning technicians use powerful non-toxic solutions to drastically reduce their number and neutralize their breeding grounds. Our products and techniques are environmentally friendly and do not cause discoloration or unpleasant odors. We recommend you use our Dust Mite treatment services periodically with our cleaning services to ensure that you maintain a healthy living or working environment. For those of you who are sensitive to dust mite, our treatments will make life much more bearable, and we guarantee the best possible results. Our helpful and friendly consultants can help you with any queries and arrange your Dust Mite treatment to suit your timetable.